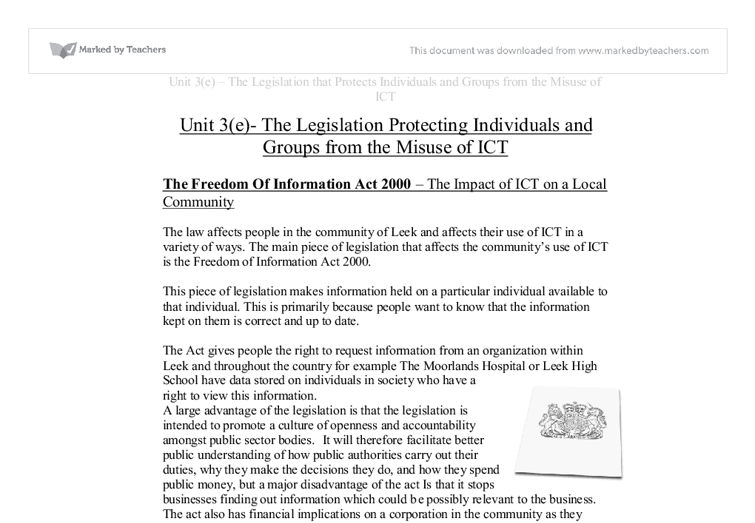 Unit 3(e)- The Legislation Protecting Individuals and Groups from the Misuse of ICT The Freedom Of Information Act 2000 - The Impact of ICT on a Local Community The law affects people in the community of Leek and affects their use of ICT in a variety of ways. 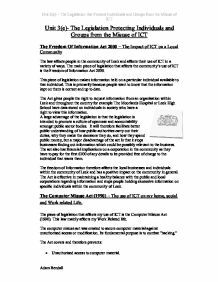 The main piece of legislation that affects the community's use of ICT is the Freedom of Information Act 2000. This piece of legislation makes information held on a particular individual available to that individual. This is primarily because people want to know that the information kept on them is correct and up to date. The Act gives people the right to request information from an organization within Leek and throughout the country for example The Moorlands Hospital or Leek High School have data stored on individuals in society who have a right to view this information. A large advantage of the legislation is that the legislation is intended to promote a culture of openness and accountability amongst public sector bodies. It will therefore facilitate better public understanding of how public authorities carry out their duties, why they make the decisions they do, and how they spend public money, but a major disadvantage of the act Is that it stops businesses finding out information which could be possibly relevant to the business. ...read more. The legislation protects me from computer misuse as no other student has the right to violate these laws and policies. The Computer Misuse Act is effective in protecting and preventing individuals from computer misuse. The Act is an efficient way of preventing the three bulleted points very well indeed and therefore is effectual in generally protecting me and generally preventing me from misusing computers. The Data Protection Act (1998) - The Use of ICT on an adult in Employment The piece of legislation that affects my dad the most is the Data Protection Act (1998). The Data Protection Act came into force on March 1 2000. The act is designed to set rules for processing personal information and applies to paper records as well as those held on computers. Personal Information includes information such as information about living, identifiable individuals that includes any personal details or identifiable data such as name or address of a person. Any business storing or processing personal data must comply with the eight principles Of The Data Protection Act. The principles are as follows: * Fairly and lawfully processed * Processed for limited purposes and not in any manner incompatible with those purposes * Adequate, relevant and not excessive * Accurate * Not kept for ...read more. The Copyright, Designs and Patents Act of 1989 make it illegal to steal or to create copies of software. It makes it illegal to make copies of software; make copies of manuals or allow copies to be made unless you have a licence from the owner of the copyright. It is also an offence to run the software on more than one computer at the same time, unless that is covered in the licence or user contract. Stephen Hawking uses custom built Software from Intel engineers and a programme called Equalizer, which was written by a company called Words Plus Inc. This software allows Mr Hawking to meet his personal and Work related needs and is specifically designed by the appropriate corporation. This means that the company, either Intel or Words Plus Inc are the owners of this software or "literacy Work" and that it must not be copied or stolen due to the Copyright, Designs and Patents Act. This legislation affects Stephen in a number of ways, It means that he cannot copy or reproduce the software he uses as the software author would have the right to take legal action against Mr Hawking if necessary. ?? ?? ?? ?? Unit 3(e) - The Legislation that Protects Individuals and Groups from the Misuse of ICT Adam Bendall ...read more. The Commissioner also has powers of entry and search of premises where it is suspected that an offence has been or is being committed under the 1998 Act. OK, we've got the general idea - but let's look at some specifics. The economic aspects of ICT Many jobs have been lost thought this revolution of computers and machines. These jobs are mostly last through the car industry because they have switched from manual labour to computer-controlled machines, to construct their cars. company's to share any information of a person who has not been asked. If the person has been told that the information is going to be shared and he agrees to it than it is legal for company's to share his information. The information obtained from either the data subject or a third party they had done all they could reasonably have done to ensure the accuracy of the data at the time. The second part of the principle which refers to keeping data up to date is qualified. The law has been set in 1998 and initially protects the confidentiality of ordinary people and the Act precludes the transfer of information to other companies devoid of the specific person's knowledge. The 8 principles of the act that organisations need to abide by are: * Data must be secure i.e.